It’s been a bit of a roller-coaster ride for Amir Khan over these last 7 months. It all started with his controversial defeat to Lamont Peterson back in December 2011, where he lost his IBF light welterweight and WBA Super light welterweight titles. Then there was the ‘man in the hat’ issue which lead to the WBA issuing a rematch. Then there was the issue of Peterson failing a drugs test and the fight being cancelled. Then GoldenBoy announced Danny ‘Swift’ Garcia was to defend his WBC light welterweight title against Khan. Oh and then there was the small matter of Khan being re-instated as WBA Super light-welterweight champion earlier this week. Quite a jam packed few months for Amir. And as if that wasn’t enough to contend with, Amir Khan has had to continually put up with the disrespectful comments from the ignorant Angel Garcia, Danny’s father and trainer, throughout the build up to this fight. But finally, after 7 months of sitting around and kicking his heels, Amir ‘King’ Khan is ready to step back in the ring and reclaim his spot as the 140lb king. This is expected to be Khan’s last fight at the 140lb weight division before he steps up to bigger challenges at 147 and I fully expect Khan to go out with a bang. Garcia is a solid, unremarkable, opponent. His main attributes are his timing and that he has decent pop but these have not been tested out against the top, prime guys at 140. While Garcia has beaten the likes of Kendall Holt, Nate Campbell and Erik Morales; neither of these guys are in their prime and he was made to look very ordinary at times against ‘El Terrible’ in his last fight. Khan has the speed and experience advantage over Garcia and I expect, well hope that, he’ll use those to his advantage. Amir is a very quick starter and I expect him to fly out of the traps and land plenty of flurries on Garcia. Khan needs to start boxing smart from now on. Anyone who watched his sparring in ‘Behind The Ropes’ will have seen Khan getting tagged all too frequently and wanting to trade instead of being boxing smart. Even new strength and conditioning Coach Ruben Tavares said he doesn’t want Khan taking unnecessary cheap shots. To his credit, Khan says he doesn’t want to be seen as boring and I think that is very commendable but it’s not smart. Box to your advantages and you’ll do so much better, not to mention look better in the process. I expect Khan to use his speed and use his combinations to overwhelm Garcia on the way to a stoppage victory. However Khan cannot leave himself open because it will give Garcia the opening to test Khan’s chin, which we all know isn’t great. Khan does not need to go out and prove his chin every time he fights. Box smart and just get the job done. If Khan does this and doesn’t stand and trade, I think he’ll finish Garcia off before the mid-way point. However if he decides to trade, it could be a very long fight and we could see a closer fight that some imagine. 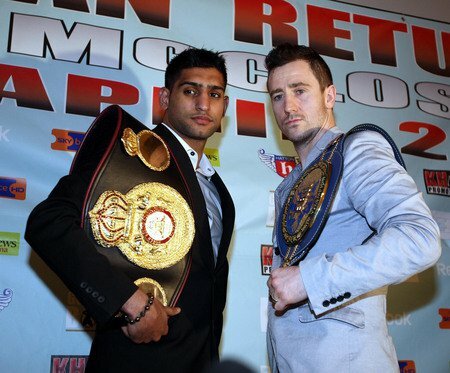 Amir Khan’s title clash with Paul McCloskey will now be shown live on the cable station Primetime. The fight, which was promoted as a Sky Box Office event only two months ago, has now fallen into the hands of the cable network station after Sky decided to pull the plug following several changes to the bill. Sky did believe the fight will still be screen live on Sky Sports 3 after financial terms were initially agreed with the Khan camp but that is no longer the case. A Sky Sports spokesperson said: “Khan vs McCloskey will not be shown on Sky Box Office or any of the Sky Sports channels as it has not proved possible to reach an agreement on TV scheduling. Now while I do agree with Schaefer to an extent, the fact Sky scrapped their box office plans for this fight should serve as a big warning to the Khan camp. While he is a fans favourite, he is not in the Ricky Hatton mould over here and there is a lot of work to be done on that front and he is not a huge star in America either, so Schaefer should be very careful about calling Khan “boxing’s next true superstar” as there are plenty more viable candidates. Sadly not a lot of people will see this fight now as not many people have access to the Primetime channel, just ask Carl Froch, but Khan will have to win and win in style in order to get fans back on his side because at the moment something isn’t quite right with the chemistry. And if this is the case, Schaefer and Khan can forget about being “boxing’s next true superstar”. The Klitschko brothers are at it again as Vitali Klitschko is on standby to take over from David Haye if younger brother Wladimir is ruled out. The Klitschko brothers are known for being master match-makers and coming up with these unbelievable contracts where the ball is always in their court. Now some of you might believe it is their choice and right as they are the champions but if Haye has to sign a contract with Wladimir that states if he is unable to make the fight and Vitali can step in, then the boxing world has really gone to cloud cuckoo land. The contract that was drawn up for fellow Brit challenger Derek Chisora was laughable enough (if he beat Wladimir, he would have to fight Vitali in his second fight and give Wladimir a re-match) but this really would take the biscuit. Personally I think that Haye should fight either one of them, his legacy wouldn’t be secure as a heavyweight without either fight. He would just be known as the man who beat up on Audley Harrison for a round. I believe that if Haye signs a contract to fight Wladimir and then for some odd reason Wladimir cannot make the fight, then he should be stripped of his title. He pulled out of two proposed fights with Derek Chisora and hasn’t fought, let alone defended his title since he beat Samuel Peter back in September of last year (which again was a joke of a fight). 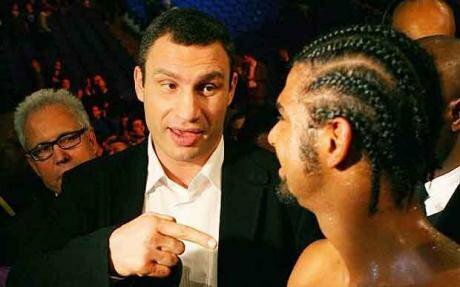 Then there should be a separate contract drawn up for Haye-Vitali. But we all know that Haye will have to sign the contract for Wladimir stating that Vitali can step in if he is injured because Haye needs this fight. Don’t get me wrong, the Klitschkos’ need it too but Haye more so. He was the one that was supposed to light up the heavyweight division, bringing back the glamour. Heck, Golden Boy Promotions are even behind him. But the sad thing is, and something people seem to forget is, Haye says he’ll retire by his 31st birthday. So even if he does unify the division, once Haye turns 31 the belts will go right back to the Klitschkos’ and the division will be back to normal. The contracts have yet to be signed, with talks between managers Adam Booth and Bernd Boente, so there will be plenty of twists and turns left in this tale. That is one thing I’m certain of. Keep checking back for the latest information regarding this heavyweight clash.